Here we go! Today I’m embarking on my first-ever blog challenge, and actually not just one but two. 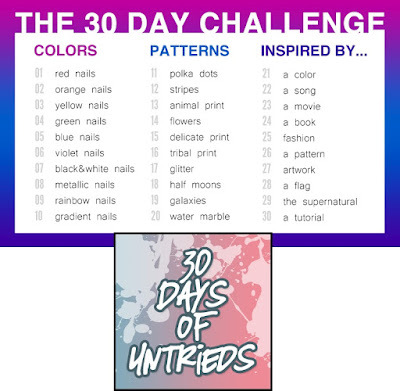 I’m going for both the 30 Day Challenge and 30 Days of Untrieds, inspired by Rachel from Polished Criminails, who is doing the same. 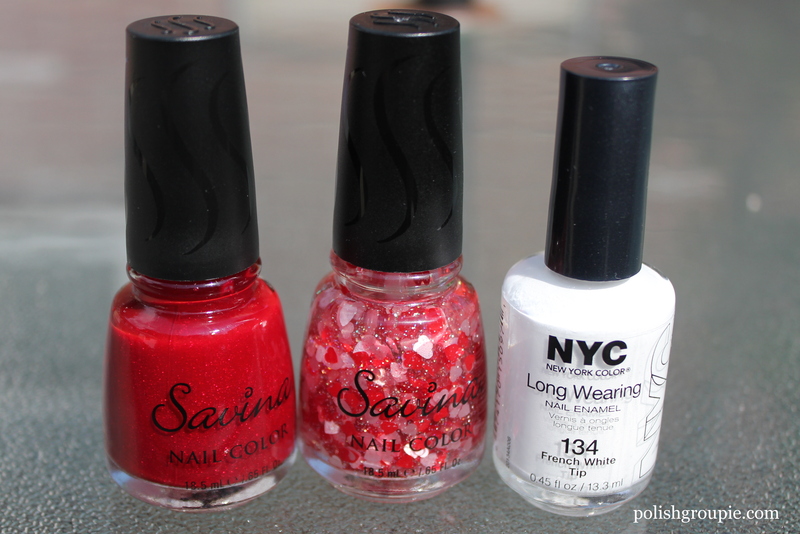 For my nails I used two coats of Savina Ruby, followed by one coat of Poshe fast dry top coat. 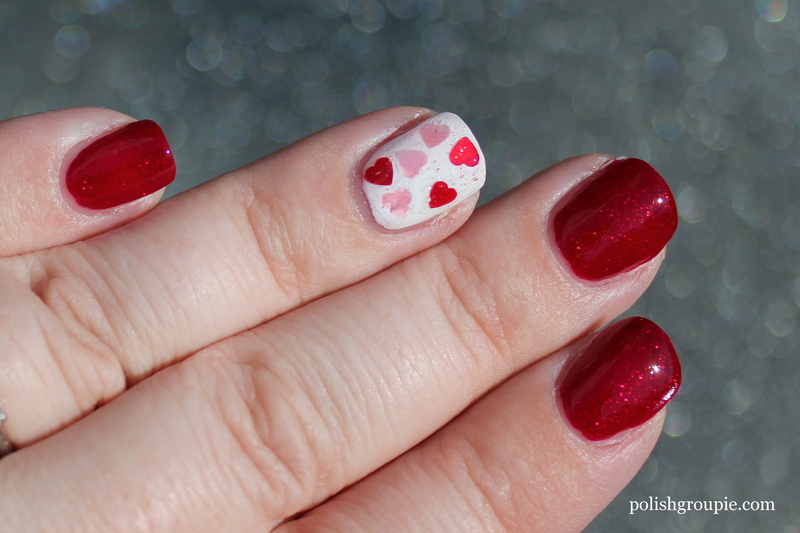 On the accent nails, I used three coats of NYC French White Tip, one coat of Savina Hearts and one coat of Poshe. I didn’t think of myself as a fan of red nail polish, but I actually liked this one quite a bit once it was on. It’s more of a jelly polish with a red shimmer. It went on very smoothly and seemed to dry pretty quickly, though the finish was a little bit bumpy. Definitely needed the Poshe. White polish can often be tricky, and NYC French White Tip was no exception. First coat was extremely streaky, second mostly covered, third did the trick. I was a little disappointed with Savina Hearts. 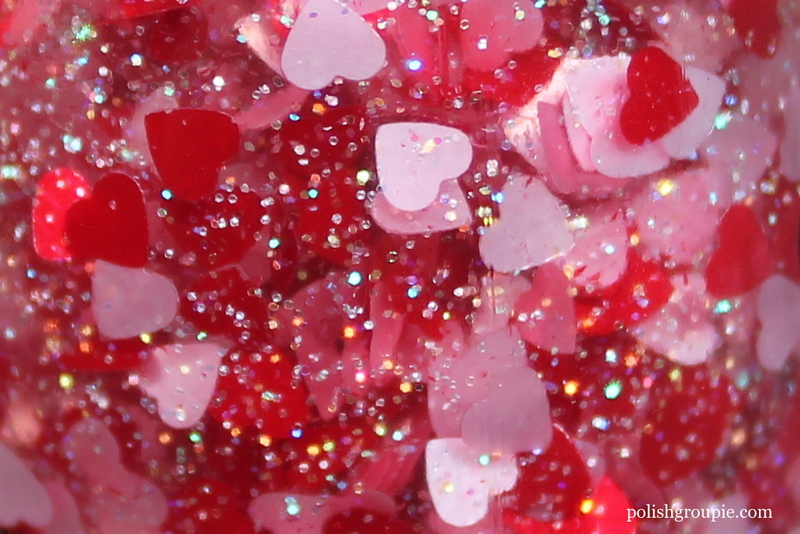 Since the bottle is jam-packed with heart-shaped glitter, I hoped it would go on with decent coverage. But that wasn’t the case for me. I had to fish out and place the glitter. I tried dabbing; that didn’t work so well because I was just getting lots of the base with none of the hearts. In the end I grabbed a toothpick and used that to place them on the nail. It turned out a little messy. Next time I will try to apply a coat of Savina Hearts that has no glitter at all, just so I can build up a good base of the iridescent shimmer first, and then fish out and place the hearts. What do you think? Any tips and tricks for applying polishes with large glitter? Please visit some of the other bloggers that are participating in the 30 Day this month. I know we will need a lot of encouragement to get through!